​Environmentalists filed a federal lawsuit in Washington, DC this week in an attempt to force the United States government into disclosing details about any hydraulic fracturing, or fracking, being done in the Gulf of Mexico. The suit, filed Thursday by attorneys representing the Center for Biological Diversity, takes aim at the Obama administration’s failure to promptly respond to Freedom of Information Act requests made last year for documents pertaining to fracking operations in the gulf. Having neglected issuing a response to the Arizona-based environmental group’s October 2014 FOIA request for records identifying any wells in the gulf’s Outer Continental Shelf (“OCS”) region where hydraulic fracturing has been used since January 1990, both the Bureau of Safety and Environmental Enforcement and Bureau of Ocean Energy Management were named as defendants this week in a complaint that seeks to have a District Court judge compel the agencies to provide answers. According to the suit, the Center for Biological Diversity believes the BOSEE and BOEM have authorized fracking to occur at over 100 sites in the gulf during 2013. FOIA requests for records about those alleged operations have gone unanswered for months, however, and environmentalists say it’s imperative that the government explains as much about the allegations as possible on account of the long-term effects associated with the practice not being quite clear at this time. “We know it’s happening and know the government is approving it — the public ought to know how much and how often. Fracking doesn’t belong in the ocean, and the federal government has a legal and moral obligation to reveal how widespread this inherently dangerous activity has become in our coastal waters,” she said. Yet Samantha Joye, a marine sciences professor at the University of Georgia, told the Associated Press this week that no scientific studies have actually been conducted yet to take on what effect, if any, fracking chemicals have had on the ocean. "It is unfathomable that this process is not tightly regulated and restricted both on land and at the sea bed," she told the AP. "There's very little public information on the practice, and to date, we just simply don't know a great deal about where and when it's taking place," Jayni Hein, a policy director at New York University's Institute for Policy Integrity, added to New Orleans’ WWL-TV. According to Bloomberg, a surge in offshore fracking since 2007 has increased the below-water drilling market to almost the size of Russia’s onshore industry. 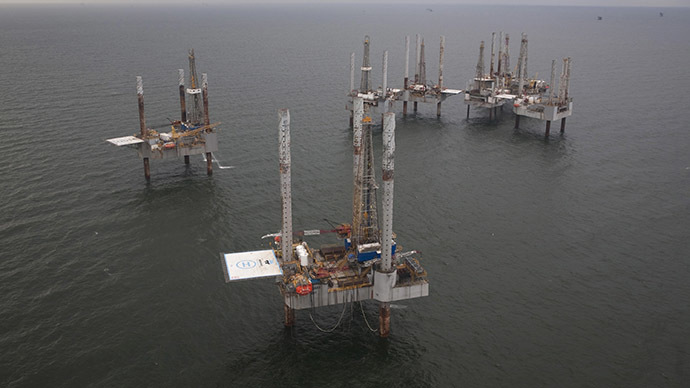 In August, the US Department of the Interior received $109,951,644 million in high bids for 81 tracts in the Gulf of Mexico covering 433,823 acres, with more than one-third of those bids coming from offshore energy companies. “The Gulf of Mexico has been and will continue to be a cornerstone of our domestic energy portfolio, with vital energy resources that spur economic opportunities and further reduce our dependence on foreign oil,” Interior Deputy Secretary Mike Connor said at the time. "The Gulf of Mexico is one of the most productive basins in the world, and the Obama Administration’s robust Five Year Program supports a balanced approach that encourages the development of the Gulf’s offshore oil and gas resources, while protecting the human, marine and coastal environments and ensuring a fair return to the American people," said Connor.